We combine our experience, knowledge and love for the dogs by accompanying the pups born at our place as good as possible. Our ´dog pack´ lives in and around our house, together with our herd of Icelandic horses, cats, chickens and other animals. In these surroundings we raise our pups and are they under full veterinary control. We do our best to select (health, character, exterior) the parents of the puppy’s, and invested a lot of time, money and effort. We are against inbreeding and do not favour strong linebreeding either, so we never practice in this methods and did not buy our dogs from breeders who did. Untill now (2011), all our litters have been outcross. We travelled to different countries in East Europe, Scandinavia, Baltic, Ukraine and Russia, Siberia. Our dogs are imports of the best breeding lines and working dogs from different countries and their descendants. We breed on small scale and only if we have serious and patient interested people before! the planned litter (8 litters in over 20 years of breeding). We prefer investing (proceed vactinations, making house-clean, socialize and educate) in a pup staying longer at our place, instead of advertising or selling quickly to people who do not level our standards. We use the same selection criterea with our fisrt pup until our last. We stay selective with choosing the new owners and spend all the time at the pups that are born in our house, to imprint and socialise them as good as possible. 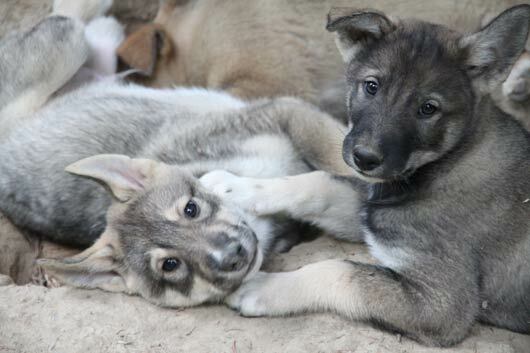 If new pupowners of our pups have a need of help with raising their pup, or have problems or other questions concerning their West Siberian Laika, they are always welcome to contact us or visit us for help or information. The reason we breed is that, by having their descendants, we nowadays still have a part of our beloved first Laiki. 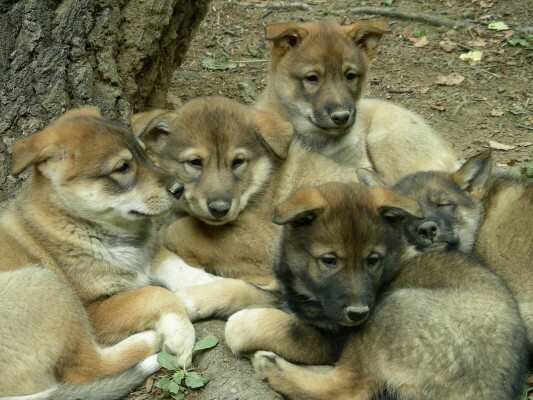 At the same time we enjoy the young dogs growing up in our pack and the inevitable factor: the new owners. Our breeding goal is that the West Siberian laika, stays a healthy, social, dog with will to please so he can live and work together with mankind as he did since ancient times and still is able to do in nowadays society. We do not select for specialism, but prefer the laika to stay an allround working dog like he was in the old times and still is nowadays with the indeginous Siberian people were he comes from. Descendants of our dogs are nowadays well spread in Europe (Scandinavia, Switserland, Germany, Eastern Europe etc.) and also represented in all kennels in the Netherlands (2011). They have made a good start in The Netherlands. We only breed with healthy and breed-typical dogs. Our dogs are ever since we began breeding (over 20 years now) x rayed for HD and checked for inheritable eye-diseases. Till today (2010) all our dogs and their offspring are clear free of these malfunctions. We consider this a blessing and not knowledge. We will do our best so that also in the future, the Laika will stay a healthy, working, beautiful, friendly companion. As we did in the past, we also plan for the future to organise different activities, at which you can participate with your Laika. Doing this, you can experience for example the working possibilities of your Laika. 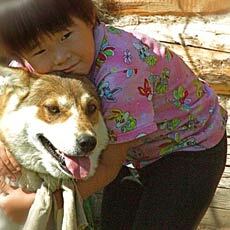 We organize: packsack hikes, tracking training, hunting training, horseback riding with dog, sled dog training, agility etc. Our dogs work also as huntingdogs and are respected for their great workingskills. Our house is situated in the middle of a Belgian hunting area in the forest and here it is possible and allowed, to have our dogs running free hunting for wild pig, deer, roedeer ect. This is very different from the huntingsystem in for example, the Netherlands. In Belgium this is a normal way of hunting and it alowes the laika to hunt and praktice the huntingskills like one of his original huntingtasks in Siberia. Although we did succesfully huntingtests we value a dog to his skills in practice. 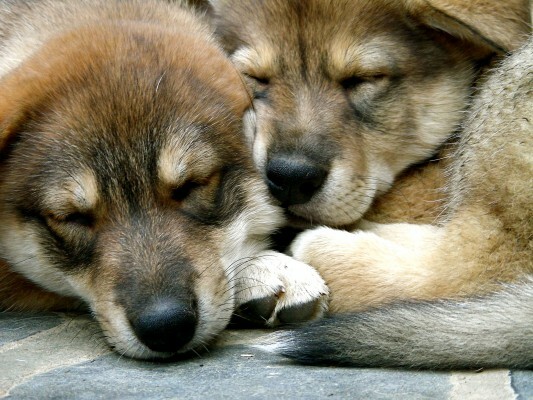 We will not sell our puppies to hunters wich see a dog as no more than a huntingtool, but expect from a hunter that he also values the dog as a partner and familymember, and treats him like that. In the more than than twenty years that we breed, we never had one of our West Siberian Laiki ofspring getting a new home. Also for the future we want to keep it like this and that is why we are very selective for selecting a home for our puppies. We do not think a bench is a suited home for your dog to be locked in for longer time and thus do not sell our puppies to people who favour this kind of dogkeeping. From our laikapuppy-owners we expect that they give all their effort in giving their laika: the education, activity, care and especially the attention, so also the time, that he deserves as a Laika. So they can enjoy a Laika-life long a max of nature in a max of dog. We only breed if we have serious reservations. We ask reservationmoney, This money is not for the purchase of our pups, it is not for us, it is for the puppy-treasure of our puppies. We also spend part of our money to the puppy-treasure to each puppy. Together with the new owners of our puppies, we select a good cause, to spend the puppy-treasure on, that contributes in helping a poor dog. This way our puppies can make a difference in another dogs life which was not so lucky. We don’t advertise with Laika puppy’s for sale, but serious people interested in the breed, are very welcome to contact and visit us for more information.